Background: The local therapy is a particularly proper approach in treatment of cancer diseases, at which the drugs are highly toxic. Unfortunately, antitumor drugs diffusion is quite often limited by hyaluronic acid layers abundantly found in a cancer tissue. Methods: The undertaken approach assumed relaxation of hyaluronan layer by using a hydrolytic enzyme - hyaluronidase. The considered process corresponds to the heterogenic catalysis with substrate occurred as a layer and a catalyst in a native form. It was shown that enzyme concentration around 4 mg/L kept for 10 minutes in body fluid surrounding HA layers is enough to allow the drug to diffuse. Results: Cyanocobalamin, as a model drug, was applied in diffusion processes testing. The possibility of hyaluronidase releasing in the place close to hyaluronic acid layers was also considered. 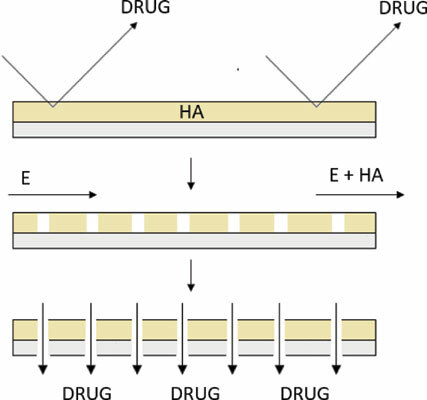 Hydrogel carriers promoting fast release of hyaluronidase were characterized. The profile of releasing Hase from the tested carriers based on κ-carrageenan or sodium alginate with polyvinyl alcohol corresponded to Higuchi model. Conclusion: An expected rate value (the mass transport coefficient app. 4.0.10-7 m/s) was obtained for blends 0.5% κ-carrageenan, 4% polyvinyl alcohol and 0.5% sodium alginate, 6% polyvinyl alcohol. Local therapy, mass transport, hyaluronic acid, hyaluronidase, enzymatic layer hydrolysis, polymeric carrier.